We are pleased to be able to offer you the 10 troy ounce Credit Suisse gold bullion bar as a gold bullion item that you can trade on our global markets. 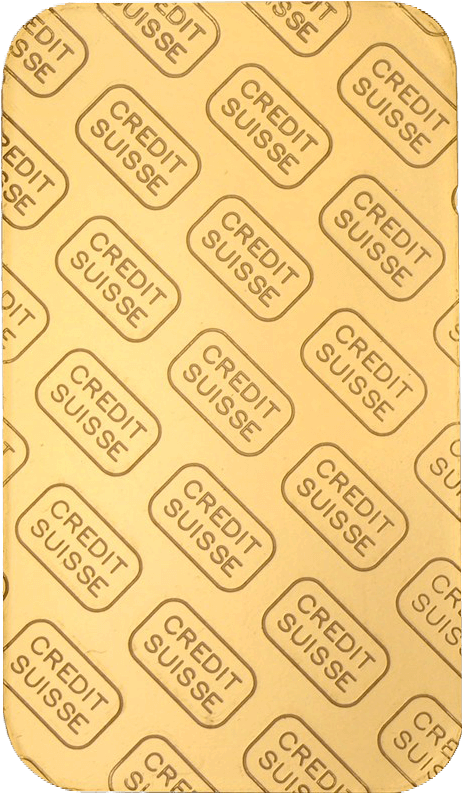 The reverse of the bar has a miniature version of the box containing the Credit Suisse stamp repeated diagonally from top left to bottom right as shown. All of our other physical bullion bars and coins can be found on our main products page for gold, silver and platinum. Credit Suisse, founded in 1856, is head-quartered in Zurich, Switzerland, and is one of the largest European and international banks. The Credit Suisse marque is one of the most globally recognised of all international gold bullion bar stamps as it has developed a first class reputation for generations that has been synonymous with high quality bullion products. This has resulted in their Credit Suisse marked products being highly sought after and liquid gold bars, second in Switzerland to Pamp which probably has the most liquid products of all Swiss bullion producers. 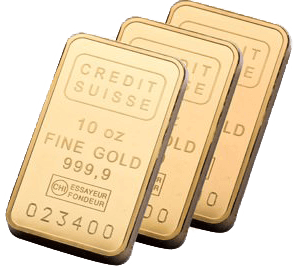 Credit Suisse's gold bullion bars range from 1 gram (0.032 troy ounces) to 10 troy ounces and it only produces 2 silver bar weights; 500 grams (16.075 troy ounces) and 1 kilogram (32.151 troy ounces). Our global physical bullion markets currently only offer the 10oz Credit Suisse gold bullion bar. Even though the stamp on the gold bullion bar is Credit Suisse, it doesn't mean that they actually physically refine and produce the gold bar products. The 10 ounce gold bars that we have available for trade are refined and produced by the world renowned LBMA approved precious metals refiner, Valcambi. With the Valcambi created 10 ounce Credit Suisse gold bar, Credit Suisse set the standards and minimum level of quality control it wants in its bars to which Valcambi will adhere to in its refining and production process. Description 10 fine ounce gold minted bar, of minimum fineness 999.9, and bearing a serial number and identifying stamp of Credit Swiss as per Appendix A Good Delivery Refiners*. Produced by Valcambi. * Appendix A can be found in our bullion product catalogue. If you are uncertain about any of the above terms, we have broken them down with explanations on what they all mean. 10 oz Credit Suisse gold bullion bar one of the few products that are eligible to be pledged as collateral to raise cash funds. This is achieved by using ABX's electronic Vault Warrants (eVWs). You will still retain legal title to the gold bullion but you are not able to trade or withdraw it until the terms of the Warrant have been settled. When you pledge your gold bullion, you never lose legal title of direct ownership over it. Only its sale & movement is restricted under the terms of the collateral contract for the duration in order to prevent misuse / fraudulent activities occurring. 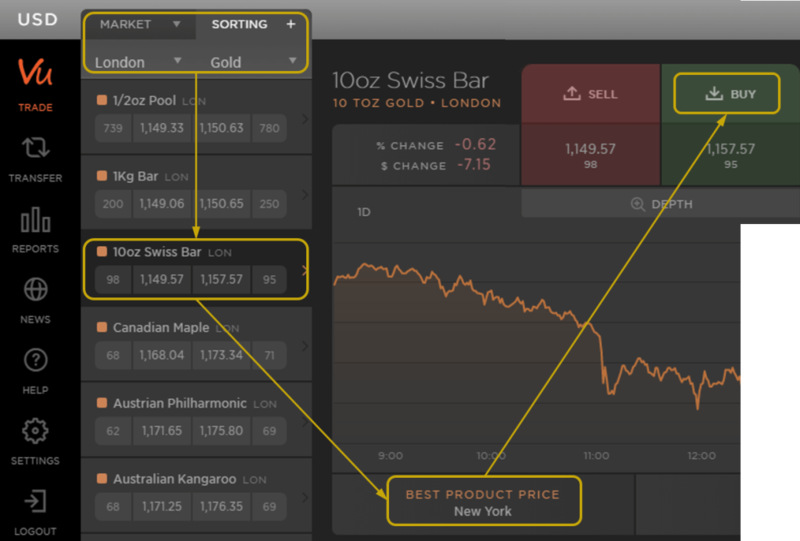 In our on-line trading platform, MetalDesk, you can easily find the cheapest item you are looking to buy or the cheapest form of gold, silver or platinum worldwide at a glance. It is a simple process to create a holding with GoldVu and start buying and trading items such as our 10 ounce gold bars on our markets worldwide.